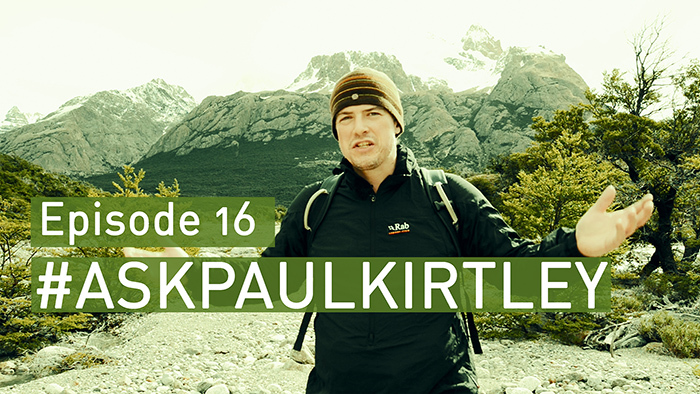 In this episode of #AskPaulKirtley I answer questions on the breathability of eVent fabric, the utility of military surplus gear for bushcraft, fire management for first timers, gaining consistency with bow drill, and provide some thoughts on realistic year-round carbs foraging as well as getting a little philosophical towards the end. first let me say how impressed I am with your common sense, straight forward, yet highly informative answers; something that is all too often missing in ‘bushcraft discussions’ which are so often based on survivalism and equipment. Regarding army surplus , it might also be worth mentioning that 1) military camouflage is excellent when tracking wildlife, but 2) not everyone likes to see military gear and, in certain countries (like Argentina for example? ), there may also be political issues that the wearer should keep in mind. Personally, I swear by my smock and Gore-Tex jacket, but would NEVER consider going the full Monty. As you say, if I was going on a serious trip I would rather invest in lightweight (but reasonably priced) gear. Thanks for your comment. Your feedback is much appreciated. Also, you make some excellent points with respect to military clothing. I agree that camouflage can be very efficacious in allowing you to get close to wildlife – something I teach on my tracking courses but neglected to mention in this Q&A session. And yes, we do need to be wary of wearing military clothing in some parts of the world, so that we do not look like poachers or mercenaries (some African countries in particular). Also in some countries, it is against the law to wear some colours unless you are in the military (for example in Barbados, which catches a fair few people out). Hi Paul, Thanks for another brilliant podcast. “Clever Monkeys” Title for the next Paul Kirtley book maybe. Love it. I have been following your podcasts with interest and enjoyment since their beginning. However, two things occur to me. Firstly that not all the questions are of equal interest to all of your followers and secondly that you are increasingly needing to remind us that you have already dealt with a similar question in an earlier episode. This must be tiresome for you, but it is helpful for us. Your summary of content for each episode is very helpful, but I am beginning to find myself trying to skip through some of your casts for the bit I really want to hear or rehear, especially when I go back to your earlier episodes: this is not easy. Is there any way you can signal visually where each new question starts and finishes? Hi Tony, good to hear from you as always. Yes, I do seem to receive some questions which overlap or build on previous questions. This is fine with me and I’m happy to answer them on the show, as well as refer viewers/listeners back to useful reference material. If, however, the question has already been answered directly in a previous episode, I won’t include it again but, rather just send a link to the relevant episode to the person who asked the question (again). I used to include a text version of the question in the episodes – when asked via Twitter or email – and this provided a visual cue as to a new question but this always took an inordinate amount of time to create. Now that I’m producing a show per week, I do not have the capacity for this extra editing. If I get some assistance with the production, I may revisit this feature. What I’ve started to do on YouTube, however, is list the time at which each question is addressed. YouTube has a nice feature in that these timestamps are automatically made into links, which when clicked take you to the relevant time in video. Unfortunately this is not something I can easily replicate here on my blog. So, it might be worth you going over to my YouTube channel and checking out the episodes there if you want to revisit particular questions or just skim to particular questions in new episodes. At present only a couple of episodes have been timestamped (#14 and #16). I will be doing this going forwards with future episodes but have yet to find the time to timestamp previous episodes. I think this will, ultimately, be a useful exercise for the benefit of my viewers but one that will be time consuming for me. Due to other commitments I can’t prioritise this at the moment unfortunately. Again, in the event of me getting a production assistant, it may be completed more quickly. I really appreciate your feedback and input on these shows, how you view them and how you obtain value from them. I’ll do my best to make them as user friendly as possible going forwards. Thanks for the detailed reply. I shall use your suggestion about YouTube in future. Some of us oldies need a bit of help with this new-fangled technology from time to time. By the way, I was much impressed with the way you dealt with the religion question: it was inline with your characteristic straightforward approach. It was interesting to read the respect given you by correspondents who hold different views- reflects well on them too- and promotes a great atmosphere on the blog. Thanks also for the comment regarding my approach and the community of people who read, watch and listen to material on this site. I am genuinely most thankful for this community and their collecting experience, knowledge and wisdom. Thanks for the fantastic answer! It is true what you say about our mindset being stuck in a modern day consumer mentality. I think, as you say, storage of foods seems a key factor and something I will have to look deeper into. I’m glad you found the answer informative. Let me know how you progress with your research, experiments, etc. Another informative and very well presented episode Paul. I enjoy watching/listening when I can. Your podcasts as always are very informative and I have not missed one yet. I really appreciated your sensible answer regarding religion in this episode, which at first was something I was surprised you would be willing to answer. Yes I am a religious person but I don’t let it define me. Thanks for your feedback and comments on this episode. I did consider not answering the question but I thought that would be a sort of dishonesty. Glad you appreciated my willingness to answer it. As usual the no nonsense and straight forward answers with your personal touch which is so appreciated. Nothing substitutes experience. But the final part of the episode containing the more philosophical thoughts of mankind’s context in wild life so to speak is very well put. I commend you for navigating such a complex and sensible subject in just a few minuttes. Thank you Ken. I’m thankful for your comments and your thoughtful, balanced appreciation of what I said in answer to a question many would just have dodged. Paul, I enjoyed #16 as I have all your videos, right up to the end where you for some reason felt it necessary to literally attack Christiananity . I’m sorry but I find it such bad taste, that I need to cancel my subscription to the blog as well as You Tube. Why you couldn’t have just said your an environmentalist and leave it at that instead of insulting a very large population of faithful subscribers. That being said, also believe you are one of the best in the business, a true and dedicated outdoorsman, I shall miss you in the future, but it was just to much. I think I sound like a broken record here but another good episode. The bit about us being ‘clever monkeys’ almost made me laugh out loud on my bus trip to work. In all seriousness though I think your response to that particular question was a good one. Really looking forward to attending your woodcrafter course in the new year. Hey Mat, glad to bring a smile to your face on your bus journey. Thanks for your comments on this episode and “that” question in particular. Your support is much appreciated. Looking forward to seeing you on the Woodcrafter. Hi Paul, Thanks as always for the supreme effort you put into these regular Q and A sessions for free. I can see that I’m not the only one who was interested in the last question you answered. As you know I’m only a hobbyist bushcrafter but spiritual side of things has been given much thought as I’ve trodden down this path and I now have an agnostic view of things. A question you thought whether to answer or not but I’m glad you did because it’s arguably a question many outdoor folk will have asked themselves but perhaps never voiced it. Thank you. Hi Paul, thanks for your reply to my questions. Sounds like a good trip to Patagonia. Just to add the instructor was failing the bow drill in high summer, very dry forest conditions so it was pretty disappointing. Will have a look at your bow drill article though, thank you. Sorry, I didn’t realise the religion question would cause issues with some of your followers. I am not religious but feel there is a deep connection with nature that I thought first nations will have explored in more detail. I used to be a person who couldn’t decide whether to be a Christian but when a girl I used to teach got cancer a month before Xmas, I figured religion wasn’t for me, besides I only feel spiritual out in nature. Thank you for respecting my question. I’ve not listened to this one before, although I’ve subscribed to you for quite some time and do enjoy your online elementary bushcraft course very much. I love your candid responses. You’re an honest man. As a believer in Christ, I am not offended or disappointed in you. I think the ‘have dominion’ thing over nature simply means to have custody over, which mean we are responsible for this earth that (I believe) God put us on. Just my own input here. Hope it doesn’t offend you. Hi Marcel my friend, you are also honest and I always enjoy reading your comments, all of which are always the result of thoughtfulness. I like the interpretation of having responsibility for nature a lot better. Unfortunately I’ve had some remarkably unpleasant and (to me) abhorrent interpretations of this put to me in the past, that we are special, that we are above nature, that God put nature there for us to exploit. As you can imagine, I HATE that attitude, whatever the philosophical justification. I’m glad (but not surprised) you are more enlightened.